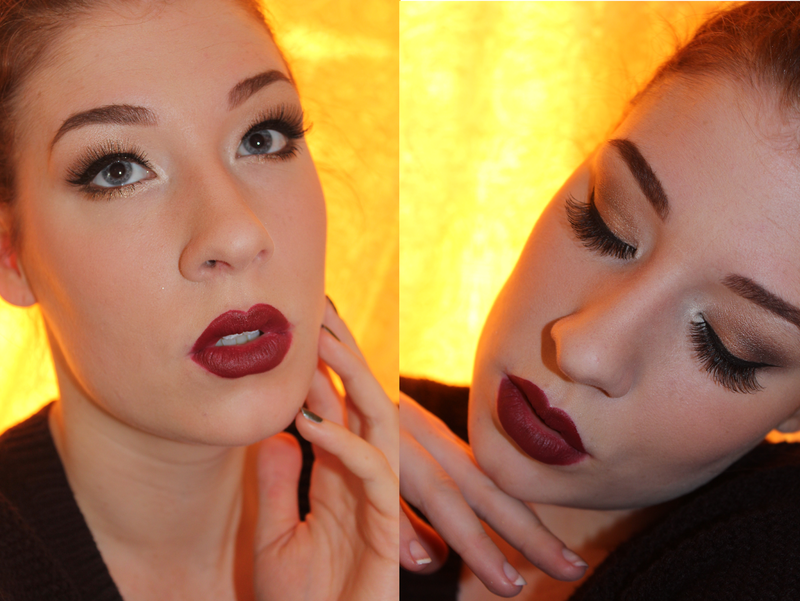 I'm never afraid of using dark lippies, dark brows, tons of liner and long fake lashes. This is exactly what this look is! I have been wearing this makeup look constantly. I'm all for a matte face and berry lip this Autumn, and this is such and easy look to pull off. I have teeny tiny eyes/eyelids so I can't pack much shadow on them, but I have to make use of what I got! This look could be so much more golder if you have more eye space, and you can even throw on some gold glitter liner all over the eye to add that extra bit of Christmas. On the eyes I used mostly the Urban Decay Naked 2 Palette. I used a mixture of Half Baked and Chopper on the lid to bring out the blue in my eyes, I then blended that out with Snakebite and Bootycall up to the eyebrows. I used a bit of Blackout to darken it slightly. I also used Urban Decay's Zephyr in the corners of my eyes which is my cult highlighter for pale girls like me! I popped Half Baked and Blackout under the eye also. I then used a liquid pen liner to line the eyes, and then went in and tight lined the top with a Urban Decay Eyeliner in Zero. I then popped on my new favourite lashes, Let's Go Lashes (Review to be up soon! ), because they are super light and easy to apply! I also used Bewitch from the Urban Decay Theodora palette for my eyebrows. Lipstick is another cult favourite, Diva from Mac. I bought a second tube of this after summer and it's almost all gone already. Obsessed! It's the perfect Autumn colour for me, and you can add some black liner or lipstick to darken it up if you're feeling a bit more vampy. I used a Revlon foundation and L'oreal BB powder foundation for my face - I rarely use concealer! And that's my to go to look for this Autumn! I am in love with gold shimmers so I can see myself carrying this over to the Christmas period - Perfect for a Christmas meal! What are you liking this Autumn? Girl. This is GORGEOUS! I have blue eyes as well, so this is a perfect look to try! Love it! I'm workin on the "vampy" lip thing...I've never been bold enough for it, which is funny because I love bright orange and coral lips in the summer! Great look Hannah, love it! Thank you! I'm reviewing a lipstick from Mac soon which is perfect for people who want to go vampy, but want to start out on something a bit more subtle?! Thanks so much sweetness! Really pretty makeup - I love the autumn so I can bring my darker lippy shades out. I saw a few on MELT as well that I can't wait to buy! Have you seen these before? Oh no I Havant! Will check it out! Thanks for the comment Harriet! The lipstick is lovely good for the fall.